Isaac Newton is a pretty bright coal in the fire pit of the scientific world. Okay, maybe he had his personal problems, but he was a brilliant thinker. One of his strongest assets was being able to find the simplicity and identify the essence of a complicated problem. His basic observations of natural phenomena became translated into elegant mathematical expressions. (1) The rate of change in temperature of an object is proportional to the difference in temperature between the object and its (assumed) constant environment. Well, mathematics is a wonderful language… we can express mathematical ideas both in words, as I just did in equation (1) above, and we can also express the same ideas, usually more succinctly, in symbols, as I will do in equation (2) below. Both equation (1) and equation (2) say and mean exactly the same thing! Here, we’re letting the symbol T represent the temperature at any time, t. We might also write this as T(t), but that gets cumbersome. T is fine. The little d means “a very small change.” So, the first part of equation (2) means, a very small change in T during some very small interval of time, dt. This is also called the “instantaneous change” of T, or the derivative of T with respect to time, t. From equation (1), it is associated with the part saying the rate of change in temperature. We also see in equation (2) the letter k, which is often used to express constant values. In our case, it is representing what we call a “constant of proportionality,” which is a fancy way of saying “scaling factor.” It’s a mathematician or physicist’s way of hedging their bets. We know that the change in temperature is somehow related to the difference in temperatures, but we’re not ready to commit to a single numeric value. Besides, different materials may have different ways they respond to temperature, and the goal is to keep things as generalized as possible. From equation (1) it is associated with the part saying is proportional to. The last part of equation (2) is the difference, or subtraction, of Te from T. We’re letting Te represent the assumed constant temperature of the surrounding environment. Why do we assume it is constant, and is that a valid assumption? Well, we assume it is constant because it makes the math easier! So much of physics is finding ways to simplify the complex world so that we can better understand it, even if slightly imperfectly. Besides, in practice, in an experiment, we can control the surrounding temperature by keeping our object in a water bath, or keeping it in a refrigeration unit. But is it a valid assumption to make in nature? Try this thought experiment: put an ice cube into the ocean. The ice cube will melt – it is obviously changing temperature. How much cooler is the ocean because it gave some of its heat to melt the ice cube? The change in temperature is immeasurably small! There’s so much more mass of water in the ocean compared to the mass of a single ice cube. We consider “the environment” to be something like the ocean – a large enough mass of material (water, air, whatever) so that any heat that is transferred into or out of it will not measurably change its temperature. Therefore, from equation (1), it is associated with the difference in temperature between the object and its (assumed) constant environment. All I did was swap the dt and the (T – Te) parts around. No blood, no foul. Now, we have each side of the equation with its own d term. On the left is dT, a very small change in temperature, and on the right is dt, a very small change in time. When each side of an equation has its own “very small ____________” then we can integrate the entire thing. Integration is the process of undoing all the little d terms… turning them from “very small change in” expressions into regular old expressions. So, if we integrate dt all by itself, we just get t. If we integrate dT all by itself, we just get T. The trick is that the left side of equation (2a) doesn’t just have dT; it also has a T on the bottom there, and that complicates it a bit. The complication need not stop our progress, though. There are entire, large, print volumes dedicated to cataloging all the integration rules. There are also many available on the intertubes. As it turns out, when we have a dT divided by a T (substitute any variable, as you like), then the result isn’t just T, it is the natural logarithm of T.
Just to confirm this… The base-10 log of 1,000 would be 3, because 103 = 1,000. Okay. We can convert a difference of logs into a single log of the quotient of the same numbers! Freaky cool! Anyway, we’ll leverage that in our eventual answer, but I don’t want to bog down with more detail than I’ve already included. Like I mentioned above, the integration of dT / (T – Te) is going to involve a natural log. The integration of k dt is just going to be kt. Let’s write it all out. Hey, we’re done! That’s what we need, is equation (7). Let’s recap what it all means, quickly. T is the current temperature of our object at a specific time, t. For our purposes, it’s the temperature of our roast. Te is the temperature of the environment. 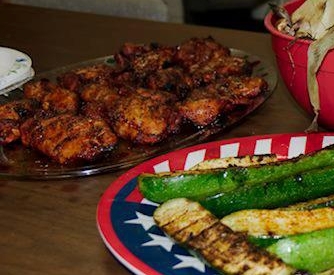 For our purposes, it’s either the temperature of the air (if we’re letting the roast sit following a stint in the fridge), or the temperature of our grill or smoker. To is the starting temperature of the object. For our purposes, it’s the starting temperature of our roast (about 40 F if you just pulled it out of the fridge). Oh, but wait… we don’t know what k is! And we can’t know this ahead of time. We have to calculate it for our particular piece of meat. But it is not difficult. Let’s walk through an example. I did this very thing just the other day when I was trying to figure out how long to smoke a 15 pound rib eye roast. I pulled the roast out of the fridge at 04:00. Using a temperature probe, I found it was 38F. It set it out on the table, on a rack, but otherwise in the open. The temperature in the room was 72F. By 06:30, the roast had risen in temperature to 45F. That’s all the information I needed to calculate my roast’s value of k! In this case, T = 45, To = 38, and Te = 72. Also, t = 2.5 hours. I used the scientific calculator on my computer because it had a natural log function. I calculated k = -0.09220946. And that’s all I need, now, to find how long I have to cook this roast, for it to get to any temperature I want! For this roast, I wanted to smoke it at 220F, and pull it off at an internal temperature of 115F, because I was then going to “reverse sear” it by running the Big Green Egg at 500F for 30 more minutes. Best estimates meant that this would bring it to 125F, and then it would rest for a time, rising another 5 to 10 degrees, for a finished internal temperature of 130-135F, a nice rare roast! Now, T = 115, To = 45, and Te = 220. Plugging in the numbers, and using my value for k that I calculated, above, I found that I needed to smoke my 15 pounds rib eye roast for just over five hours. Perfect! Since I had to be serving at 1pm, I just backed off the smoke time and the “reverse sear” time and the rest time… and saw that I needed to get the roast on the Egg at 06:45. Brilliant! No guess work! And the roast came out perfectly done… rare and beautiful. Now, you could argue that since I had a temperature probe, why not just use that, and pull the roast off when it hit 115F, and so on. Sure, that is great when you don’t have a time constraint… but I needed to serve this roast at precisely 1pm… there was no wiggle room! And when there’s no wiggle room, you can’t just guess; you have to use math and science. Is there any doubt that food binds a community together? Whether it’s Christmas dinner or a 4th of July picnic, our best dining is generally part of an ecosystem of relationships… our relationships to one another, and to the food, in preparation, presentation, and ingestation. Although I work for a relatively large company, our “branch” location in the metropolis of Skowhegan, Maine, is a close-knit group. There are roughly 30 of us there. We all know each other well. We’re friends and family. We know each others’ kids. So when we found out that a friend and coworker was coming back to our campus for a visit, well, it was time to eat! I wanted to reprise my smoked paprika chicken, as I had tweaked the recipe a bit to give them more kick. Check, that’s on the menu. However, some of the folks wanted a reprise of the Great Brisket Experiment of 2012. That involved an overnight stay at the office (our Big Green Egg is courtesy of our friends at our corporate location in Nashville), and lots of mistakes! Well, why not? One of the blokes got his hands on 15 pounds of rib eye roast… let’s get that again… 15 pounds of rib eye roast! And I, I took the road traveled by the freaking butcher! The thing was beautiful… and was delivered Wednesday morning for a Thursday lunch. Okay, so letting it be suspended in mid-air to age for a week was out… I decided to go with a variation on a wet rub I’d used before… based mostly on sweet Vidalia onions, which I thought would stand in nice contrast to the now spicy paprika chicken. Why not a simple dry rub? Well, because I wasn’t in the mood for that. Lunch had to be served at 1pm. I wanted the roast to rest for 45 minutes prior. 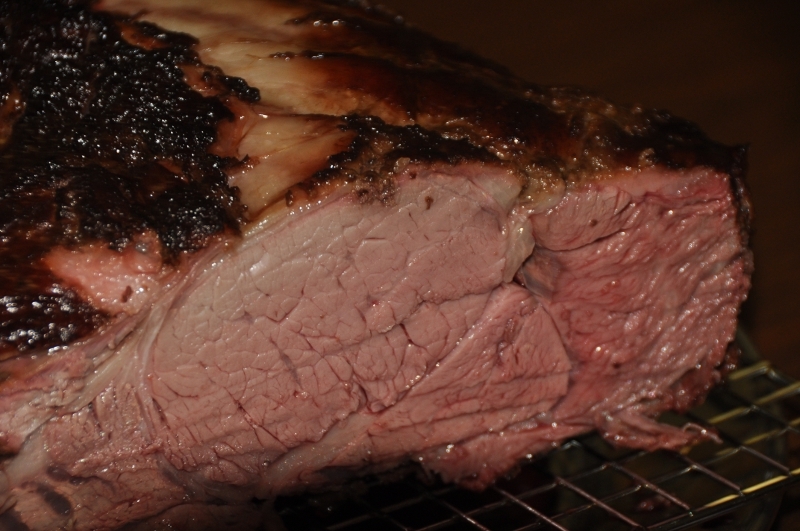 I wanted to “reverse sear” the roast for 30 minutes before that… and so on. I had to determine when it need to go on the BGE. I knew I wanted to smoke it between 220F and 250F for at least several hours, but to answer the question of when to put it on, I had to turn to Isaac Newton and his Law of Cooling. I’m going to write a whole separate post about that, because I love math… and I got to combine differential calculus with rib eye roast! How much more perfect could applied mathematics really be? Make onion glaze. Cut hash marks in fatty side of the roast. Rub glaze all over that roast. I mean, all over. Yeah, there. Ooh, there too! Turn roast fatty side down, cover and sit it in fridge overnight. Remove from fridge 2-3 hours before smoking. Put all ingredients into blender. Slowly pulse until you can run it on blend or puree, or whatever setting you like. I like to leave it a little chunky. Glaze is done. So, on the Big Green Egg, I filled up the fire box and got it all going. Got it hovering at 300F, then threw on two big hand-fulls of mesquite wood chips. Immediately put down the drain pan (which also acted as an indirect heat diffuser) and the grill, then added the roast, and closed up the Egg. This was at 06:30. I had been in the office since 04:00, doing work while waiting for the roast to come up from 38F internal after all night in the fridge! Then began the “it’s been 30 minutes… time to check the Egg” process. Only a few adjustments were needed. At 11:45, I pulled the roast off the Egg, got it up to 500F, added more mesquite, and put the roast back on. The smoke billowing from the chimney just made me feel happy… and at this point in the morning, I smelled entirely of smoke! I closed all the vents, and just let it stew in smokey goodness for another half hour, at which point I removed it from the Egg and brought it inside. Once inside, it went right onto a cooling rack (a rack is important to not steam the bottom of the roast, thus opening passages for the loss of juices) over a tray, and it sat uncovered for 15 minutes. It was now 12:30… right on schedule! For the remaining 30 minutes, the roast sat under a foil tent… and once everyone started to arrive, well, we just had to cut into it, didn’t we? [Photo credits: Derek Price (me and the Egg), and Wanda Clowater (the sliced roast)]. I’m going to be trying out the audio features on the blog. Started with a simple one – a recording of my arrangement for I’ll Fly Away, on the ukulele page. So the strategy here is to create a moist, flavorful meatloaf. For the longest time, I thought of meatloaf as just a loaf-sized hamburger. Such a philosophy makes passable meatloaf… but it was always crumbly and dry the next day – thus, terrible for left-over sandwiches. My thinking has evolved to consider the meatloaf its own little ecosystem, with its own specific needs, and certainly not just an over-sized burger. We borrow ideas from casseroles and lasagnas, and some from the world of burgers, to build a yummy meatloaf that tastes great hot over mashed potatoes, and tastes fantastic cold the next day in a sandwich. You don’t want the meatloaf to sit in the juicy run-off… that results in boiled meatloaf, not baked or smoked meatloaf. You’ll want a pan large enough to catch the run-off (I use a baking sheet with 1/2″ sides), and a rack of some sort (I use a cooling rack) to fit in the pan. Then, cover the rack with parchment paper, and poke some holes in the parchment paper. This lets the juices run into the pan, from which you can collect them after the meatloaf is done to make gravy. When I smoke the meatloaf, I just put the meatloaf in an aluminum baking dish that I’ve poked holes in the bottom. Set the oven to 375F, or the smoker to 250F. In the oven, you’ll need between 60-90 minutes of cook time, and in the smoker, about 3-4 hours. Oh, and if you’ve never smoked a meatloaf, do so! If makes vastly superior meatloaf! Except for the bacon and crushed red pepper, mix all ingredients in a large bowl, combining well. Place the mixture on your prepared cooking surface and form into loaf. Wrap with the bacon. Sometimes it’s easier to lay the bacon down first, then make the loaf, then pull the bacon up. Use whatever method works best for you. Sprinkle the crushed red pepper over the surface of the bacon, and spread evenly with your hands – work it in! 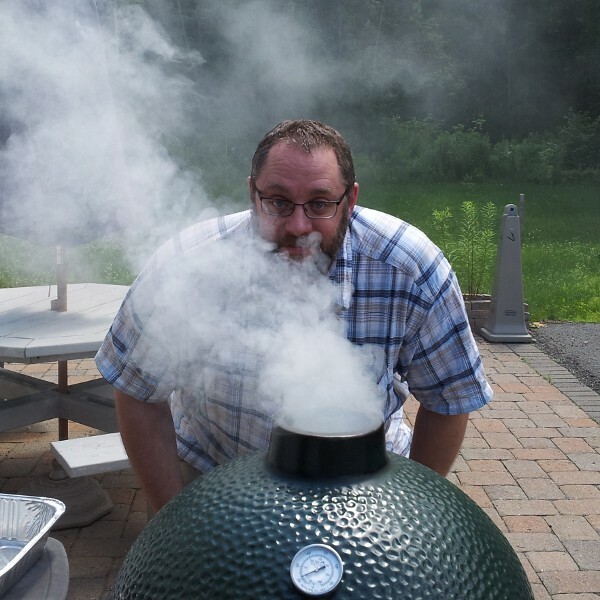 My cook times are, as above, 60-90 minutes in the oven, or 3-4 hours on the Big Green Egg. Regardless of cooking method, you want the internal temperature of the meatloaf to be 160F. After removing from cooker, let it rest under a foil tent for 10 minutes. Enjoy, but in moderation… you want to save some for cold leftover sandwiches! 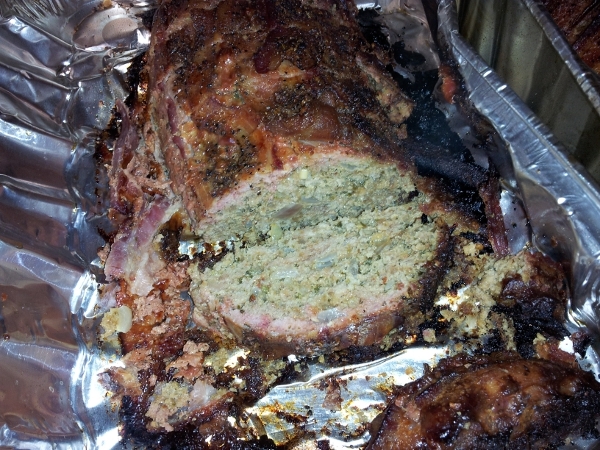 Here is a Big Green Egg smoked version of the bacon wrapped pesto meatloaf… yeah, a meatloaf with a smoke ring. Sweet! [Photo credit: Derek Price]. Just for giggles and grins, there is now an ukulele page. As I work them out, on this page I’ll be putting charts for the songs I play most often on the ukulele. For starters, I’ve added “I’ll Fly Away,” a lovely gospel tune written by Albert Brumley in 1929. The version I like is by Johnny Cash, who had the incredible ability to get to the essence and heart of a song, and so that’s the version I tried to duplicate in the chart. So, our corporate office was super sweet to us and bought us a Big Green Egg last year. It took a little while for us to start using it (Mainers are traditionalists, if nothing else), but once we did it caught on in a big, green, eggy way! Although my personal favorite work on the BGE was one of my first efforts, over-night smoked brisket, a very close second is this (relatively) fast and (very) easy strategy for chicken. The base recipe is from fellow BGE enthusiast Kevin Jett, and I tweaked it a bit for simplicity (because Mainers like simplicity, too). First, choice of chicken… I love the thighs. They are juicy, flavorful, cook up quickly, and you can get them boneless. There really isn’t a down-side! So, use thighs. Don’t like thighs? Well, make up grilled leeks or something. Obviously, this strategy is going to be BGE-specific, but you can use any smoker/grill, or even your kitchen oven. There’s about 15 minutes of prep, and an hour of cooking, but if you’re using wood chips (I recommend applewood) you’ll want to pre-soak them for a couple of hours. Pre-soak applewood chips for a couple hours. Get BGE up to 350F (for ours, this means the smoker lid is on, but wide open, and the lower vent is 80% open), prepared for indirect heat. Once it’s up to temperature, before applying the heat diffuser, toss in a handful of applewood chips. Toss chicken in enough olive oil to lightly coat. Mix the dry ingredients, and sprinkle over chicken in large bowl. Massage and work the spices into the meat. Set chicken on smoker, and cook for about one hour (until internal temperature reaches 165F), turning at about 45 minutes. In final five minutes, brush a little honey onto each thigh. Excellent when served with grilled zucchini and corn on the cob! (Photo credit: Wanda Clowater). So much of what we do, how we interact with the world, is unceremoniously summarized and condensed for easy mental consumption. We don’t do this. “They” do it. The real snaggle is that for them, we’re the “they,” as much as we may try to pretend otherwise. Well, take me. I am learning to play the ukulele. I have studied statistical physics. I really like good food. My wife and daughter are good friends of mine. I’m a crack shot. I generally get things paid on time. I write medical software. I read about boxing. My feet and knees are suffering under too much of me. I have a little film canister’s worth of sand from the Kuwaiti desert, when I was there in 1991. There is something I truly love about this chord progression: G, Gmaj7, G6, G, Cmaj7. I miss teaching math. I work with fun and crazy people. I am a recovering French Canadian. What’s the word for that? For me? I’m bigger than most sea mammals… but when Bach resolves an intricate tension in a fugue, I have been known to turn away with a bit of “sand in my eye, that’s all.” Yet, we must derive some sort of label, either for ourselves or allow it to be done in proxy. I’m broken, there’s no doubt. Genetics, weight, a stint in the USMC infantry, and lots of biking has left me wincing just thinking about having to crouch down for something. Then, considering all the other things I enjoy, food has been the longest running go-to guy… Food is an escape, a passion, and a therapy session all rolled up in a flaky pastry crust. Once I realized I could make anything I wanted, I began to cook (not bake – I’m a terrible baker); cooking is trial and error and reward and punishment. It’s a complicated emotion… but there is also no doubt I am a gourmand. My intention is to catalog as many of my cooking experiments as I can, and perhaps have a place to keep my favorite ukulele charts, too.